President Paul Kagame commemorates the 25th anniversary of the Rwandan Genocide. Rwandan President Paul Kagame began a week of solemn ceremonies on Sunday to commemorate the lives of 800,000 Tutsi and moderate Hutus murdered during the Rwandan genocide, a three-month-killing spree that began 25 years ago. 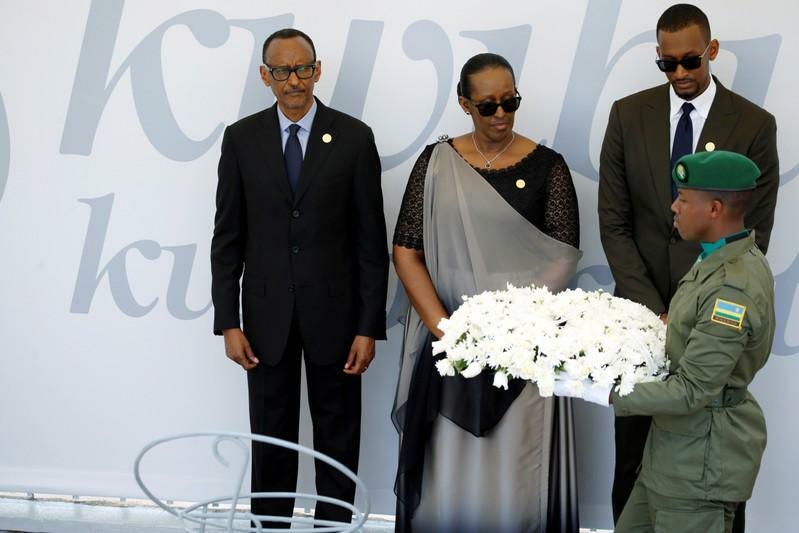 Kagame laid a wreath at the Gisozi genocide memorial site, where over a quarter a million of people are buried, before the government began an afternoon of speeches and song. “There is no way to fully comprehend the loneliness and anger of survivors and yet over and over again we have asked them to make the sacrifices necessary to give our nation new life. Emotions had to be put in a box,” Kagame said, his tall, thin form projected onto television screens around the nation. The 100 days of slaughter began on April 6, 1994, after President Juvenal Habyarimana and his counterpart Cyprien Ntaryamira of Burundi — both Hutus — were killed when their plane was shot down over the Rwandan capital. The attackers have never been identified. Among the legacies of the genocide is the International Criminal Court, which grew out of tribunals to investigate and prosecute those responsible for atrocities committed in Rwanda and during the Balkan wars of the 1990s. At Gisozi on Sunday, popular Rwandan artists sang songs like “Turabunamira twiyubaka,” meaning “honouring them as we rebuild”. “Remembering is necessary because it’s only thanks to looking back at what happened (that we can) ensure that it never happens again,” said hairdresser Olive Muhorakeye, 26. In the afternoon, officials will join around 2,000 people in a remembrance march from parliament to the national soccer stadium, where candles will be lit in a night vigil. At least 10 heads of state are attending, as well as Canadian Governor General Julie Payette and European Commission President Jean-Claude Juncker. The attack on Habyarimana mobilised Hutu government soldiers and allied extremist militia, who orchestrated the genocide to exterminate the Tutsi minority. As many as 10,000 people were killed daily. Seventy percent of the minority Tutsi population was wiped out, and over 10 percent of the total Rwandan population. Under Kagame, official policy has been to strongly discourage any talk of ethnicity. The opposition says the tight control of the media and political sphere is also used to stifle dissent. “The ruling party has decided to adopt dictatorship from early days after the genocide as they said they were protecting the national sovereignty, but now I feel that should end,” opposition figure Victoire Ingabire told Reuters.